No refunds - you are purchasing a digital copy of a product. For questions and bugreports, please reach out to me on Discord. I will continue working on this plugin and it will receive updates (which are included in the purchase). After all the work I have put into vanilla, people have asked me to post this separately in the vanilla section. This is the same file as the TBC/WotLK version. It will be easier to give support for vanilla with 2 separate posts though. Any problems pathing? Disable all "Avoid Enemy" options. Your transaction ID here is "1314324" you will need to copy this into the plugin's settings after purchasing it to be able to use it. You do this by clicking on "SETTINGS FOR SELECTED PLUGIN" after selecting HumanMasterPlugin.dll in wRobot's Plugins tab. This is a new multi-expansion, multi-functionality plugin. I wrote it to fix some of the inconveniences, bugs and "bot-like" behavior wRobot comes with sometimes. Down below is a list of features, that this plugin brings to the table. Any plugin that has the same/similar functionality to my public (free) plugins has been improved in functionality and CPU usage. Here you can find a 1:30 hour long video of a pure quester run from level 1-12 where you can see some of the plugin's functionality. The "running away" part of the plugin can sometimes be buggy within caves. Your hearthstone needs to be set to your current continent (anywhere on it) for the bot to find a path back to your regular grinding/questing spot, after using Hearthstone to get out of a "stuck" situation. If this is not the case, please disable that feature in the plugin settings. If Rocketr links are broken - get the latest version on Discord. I, the owner and creator of this file, am in no way associated with the wRobot company. By purchasing this file, you agree to the contract of the purchasing website and that alone. If you haven't bought any plugins so far (but not only), this is a fantastic start and a must have! A plugin which bundles together a ton of features, which in my opinion should already be implemented into wrobot. -Your bot will no longer be retarded and drown constantly when trying to do quests / when farming along shorelines. -Your bot will MOST of the times, not become mongoloid and fly around the world to find a vendor - if you still struggle with this in certain areas, just clean your NPC db and manually add the vendor you like. -Purchasing ammo / food will never be easier, especially when leaving a character leveling for longer durations, you do not want to go and stop him to change food everytime he change zone. Nor do you always have opportunity to babysit him when he is about to hit that 44-45 and get new lvl food. -Seems to do pulls alot better, and also has option to blacklist high lvl / packs of groups, this is the feature I like the most, as wrobot itself can be pretty stupid sometimes. And anyone who see you run into 8 mobs and die instantly 10 times in a row will know that you are botting. -Looting during combat does not only increase speed, it also looks more legit. I guess sometimes it has been abit misfortune as the bot has decided to loot instead of eat, and then by mistake aggroed a new mob while at 5-10% hp and died. But overall it's a much better option than doing it without it. -First aid also is very handy if you are playing for example a warrior or a rogue, where you do need constant hp regen and don't have access to a healspell. -Automatically using pots also helps alot. I just stock up a few stacks of pots and leave him farming mobs, it will save him those times when he by mistake gets few extra mobs on him, and it will save tremendous amount of time. Also everytime he survives dying, is one less opportunity for the bot to become obvious and run and die instantly when spawning into mobs or other similar situations. You want to minimize the amount of times the bot dies, to minimize the amount of mistakes he can make. Now to the downsides I have noticed..
-I did have issues with the protected items, but this was fixed by Matenia rather quickly, so it can be disregarded. -Running away from combat sometimes can be very bad. Actually pretty often. Alot of times my char has been fighting a mob, and when the mob is about to die he manage to get me below the threshhold, and my char just turns and tries to escape and dies. Several times has he ran into more mobs while trying to escape aswell. I do use this function in some areas, but not in all just for this reason. If you want to use it, make sure the area has easy escaperoutes that the plugin can figure out, as I imagine it is not very sophisticated(I mean c'mon, its a plugin). -Also the potion was abit stupid when I bought this plugin, it kept using it at 30-40% and there was no option to set the percentage of when to use it, so sometimes mob would have 3% hp and I would have 40, and he just pops a healthpot.. This however has also been fixed by Matenia very quickly. The support is superb, the plugin is amazing, and as I said - Most of these features are things that in my opinion SHOULD be implemented in the bot, but they are not. So this plugin is a MUST until several of these features are implemented in the bot at the same standard as this plugin provides. Matenia has proven to be one of the most responsive developers currently working on Wrobot and this plugin is a must-have if you want to avoid screaming "Look at me, I'm a bot!" His and Arc's discord is quite active and a good place to go if you need any help, someone there will usually respond to even the most general of questions. Matenia (Shacka on discord) worked with me for several hours recently to solve a problem only I was experiencing with the plugin. If that's not quality support, then I don't know what is. Sure, there will be bugs here and there as new updates are released, but they are fixed in a reasonable time. If you are only going to buy one plugin, I'd suggest making it this one. I personally have used this plugin for some 4+ months now. and have NO bad things to say. Just suggestions. I have talked with Matenia for quite some time. He has helped answer questions when Nobody else would and i commend him for his patience. This product is without a doubt, the absolute best most vital plugin I have downloaded on Wrobot so far. Anybody who is new should be given a Choice in the Store to order this. That is , as plain as I can say, how amazing and just useful this product is. Not only is he a mad genius for this but consistently provides support and updates on discord. If you are reading this, and don't have it. Get it. The run away from combat is pure genius. Absolutely needed and has saved me sooo much time from deaths and botting. Auto vending, buying drinks, and food - has made botting bearable in the 100% AFK standard. Loot during combat is a huge +, works flawlessly. Buying ammo / food etc works flawlessly. BRAVO on Thunderbluff Elevator. UC elevator, and Barrens. Elevator work is amazing. 1) In Eastern plaguelands, the bot will try to find an NPC that doesnt come out till like patch 1.9 or something. And unfortunatly at Lights Hope its the vendor / repair guy. And the bot will stand there for some minutes and try to click an NPC that isn't there. 3) Silithus needs some support or rework. The bot will find a vendor but, he will run into the mountain (since silithus is on a huge hill) and do it for hours. 4) Small bug in Arathi, as an alliance rogue - the bot wanted to vendor in the Horde area (heh) so he died many many times. 5) First Aid is a big bugged. My bot will constantly open and close first aid window and not do anything, with 1 cloth in his bags. I can also be mid level and he will all the sudden "go train" a million miles away. Add a function to close the bot when Teleported to GM island. Im not sure if droidz is up to the task but I wanted to throw it out there. I was a gm on Old Elysium and when ever we suspected a botter, we teleported them aand if they ran into the wall.. they would get banned. If they just sat down and AFK'd out they would get put on a list. I assume the rules are the same since the gm team was originally from elysium. Add flight pathing - VanillaFlightMaster from FNV was amazing, and something similar should be added , FNV's plugin sometimes causes my bot to do very very very odd things. Add an relog timer 😃 simple box to enter (example 30 minutes) and bam, your plugin makes bot logout for 5 mins, every 30 mins. Easy to setup for your needs. Definetely worth it! Not only does it work really well, if you are having any issues or you're stupid (like me lol) the support is amazing. Thanks again! I want to keep it nice and simple. Even though my Characters did not reach Max level I can already tell this plugin is essential for botting with wrobot. You can actually say the bot is incomplete without it. The asking price might seem a bit rough for some people. I think it is more than just worth it. For the Price of two fast food menus you get so many different features that make your botting life easier. Can not live without it anymore. This plugin is an absolute necessity for anyone that is serious about botting with WRobot. If you don't want to have to be constantly babysitting your characters you need this plugin. Droidz (the developer of WRobot) has actually taken certain functionality from HumanMasterPlugin and slowly started incorporating them into the base program, that's how good this plugin is. Stops your characters from drowning. 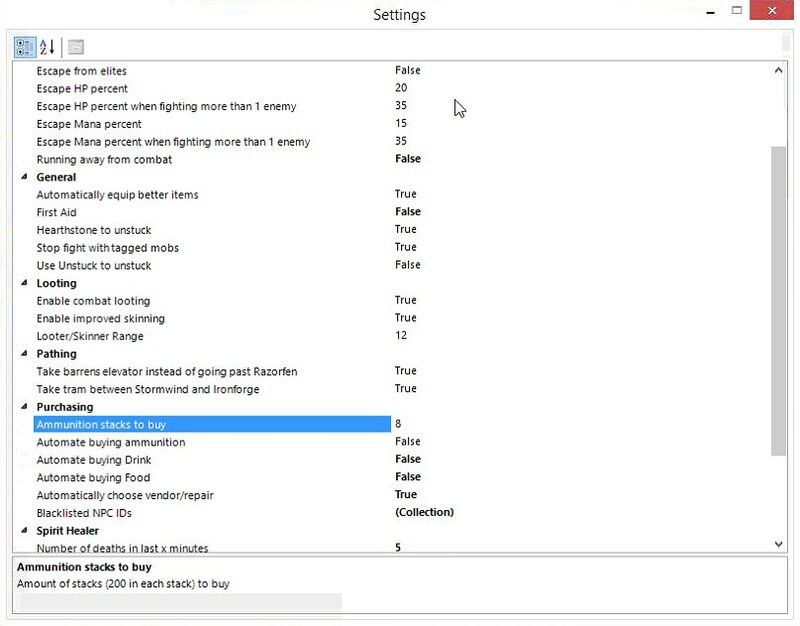 Provides customize-able functionality for fleeing combat which is extremely useful for many classes, especially melee. Auto equips gear if it's better than what your character is already wearing, also auto equips bags which is a very nice quality of life feature for AFK botting. Will train and level up First Aid for you, another extremely useful feature for melee and even some ranged classes. Has an extensive trainer and vendor database, which many profiles are lacking, so it makes up for the lesser-developed profiles and makes them usable. Automates buying ammo, food, and drink at that is appropriate for your level. This plugin has many more positives that I couldn't live without, too many to list here. Schaka (Matenia) is absolutely amazing with support for the product and as other users have posted, he'll even help to answer general questions about WRobot as well as other plugins that he's knowledgeable on. He also develops and maintains a plethora of fightclasses that are leaps and bounds ahead of most of the others you'll find here. I recently got HMP though I've used it on multiple bots over many levels and I think I have enough to leave a review. 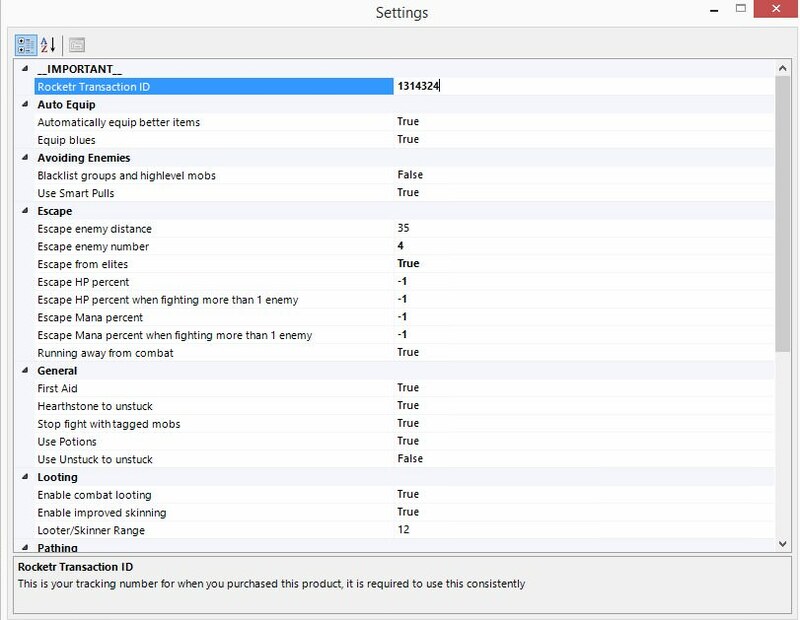 The great part is that these settings are easy to configure and understand coming from a new user to wRobot. All of the settings have a description of what they do which makes it easy to tweak what you'd like to change. Finally, the best part is the developer himself. I've already asked him several questions and gotten quick and friendly responses. He is active in his discord channel and provides support to his users, which there are quite a lot of. In fact, Matenia doesn't shy away from answering questions that aren't directly related to this plugin. For all of these reasons, I can wholeheartedly recommend this plugin. I'm positive that it will continue to get better and I believe helpful members of the community like Matenia should be supported and rewarded. So far,Metania created technically the best pluggin for wrobot. Tested most of the features and they are working like intended. This is a must have plugin.Great work .. The best of the best! Makes botting even easier, you can afk 99% of the time.